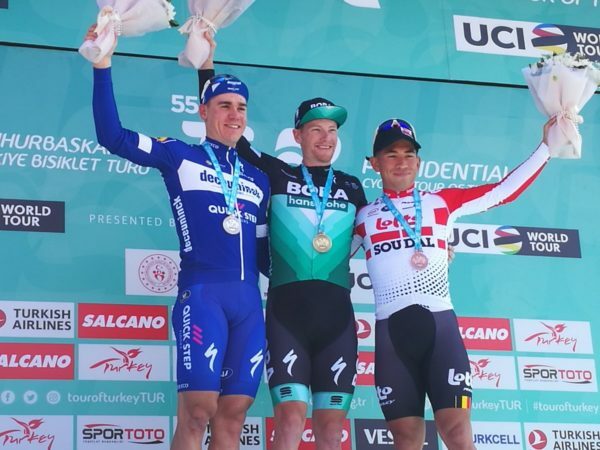 Sam Bennett on the top of the podium; a place he has come to know very well indeed at the Tour of Turkey. After winning the opening stage at the Tour of Turkey Sam Bennett said his early season form has dropped a little but he still wanted more wins. The Carrick-on-Suir man took wins in Argentina, UAE and Paris-Nice in the early weeks of the year. And since the French stage race he has taken a break, saying today that during his time off his form came off the peak it had been on. But now one of the world’s very best sprinters, he is able to win even though he may be off his best a little. “I am so happy taking the opener here in Turkey again. I really like this country and I think the country likes me as well,” he said of his victory into Tekirdağ after 156.7km. “The guys did an amazing job today; they pulled the whole day and delivered me perfectly. They take, as always, a huge part in today’s result. “In the finale, I stayed on the wheel of the Deceuninck- Quick Step guys and first I thought it might be difficult today, but then I kicked off my sprint and had the highest speed. It always feels good finishing off a great teamwork. “After my break I don’t really have the same condition but I know that, as a sprinter, you still have to get the results. I learnt a lot last year and matured a lot as a rider, and I hope to get better and better. “As a sprinter you have to win if you’re good or bad. I dipped the form a little bit too much but it was enough for today.